History: (Venom II#25 (fb) ) - Daimon Hellstrom and the Department of Occult Armaments assembled five monstrous creatures - the bull-like Gragoa, the animated idol Lord Tiki, the simian Skunk Ape, the ancient Sphinx, and the alien Worm - and had them possessed by demons. Collectively, they were known as the Monsters of Evil. (Venom II#24) - Venom, who Hellstrom had also possessed with a demon, infiltrated a DOA meeting at the Bronx Zoo, but when he doffed his disguise and attacked Hellstrom, Hellstrom unleashed the Monsters of Evil, and invited Venom to join them. (Venom II#25) - The Monsters attacked Venom, but he fought through them and confronted Helltrom at gunpoint, at which point Gragoa flung him across the zoo, into the reptile house. Hellstrom ordered the Monsters to hunt him down - either to join them, or to have his demon liberated with his death. Venom ambushed and attacked the Sphinx, and its screams summoned the others. Venom convinced them that Hellstrom was their real enemy, and led them in attacking him. They overwhelmed him, and Venom had to call them off before they killed him. He told them to get lost, and warned them that if they became a threat to humans, he'd hunt them down. The Monsters of Evil obeyed, and fled into the woods. (Venom II#42) - While Venom and his new sidekick Mania battled the DOA in an abandoned Atlantic City casino, Mephisto, hoping to prevent the DOA from ruling Hell, used DOA member Master Mayhem's body as a gateway to summon the Monsters of Evil. Venom now lacked the demonic presence that had allowed him to command the Monsters, as he had inadvertently passed it to Mania - thus, the Monsters were now hers to command. She set them on the DOA, who were no match for the Monsters. After the DOA was defeated, Mephisto sent the Monsters home - accompanied by their fallen foes, as a snack for the trip. (Deadpool: Assassin#4 (fb) ) - The Monsters of Evil came into possession of a mysterious demon-entity. (Deadpool: Assassin#4) - Deadpool and his ally Threnody were hired to steal the demon-entity from the Monsters of Evil; they did so, and were pursued by Skunk Ape, Worm, Sphinx, and several of Lord Tiki's miniatures, but eventually escaped with their prize. Comments: Created by Cullen Bunn, Thony Silas, and Nelson Decastro. Could the Worm be connected to Uncegila? Maybe it was one of her children. Given that Gragoa once inhabited Subterranea, he may be a Deviant mutate. Gragoa reminds me of the Red Bull from "The Last Unicorn", a 1982 animated film. The skunk ape is a legendary cryptid that allegedly inhabits the southern US - it's a malodorous man-ape. The Sphinx is consistently referred to as "it" despite its evidently female form - probably because it's a giant statue. (Venom II#25 (fb) ) - Gragoa was once feared as a god in Subterranea. At some point Daimon Hellstrom and the DOA captured it and possessed it with a demon, inducting it into their Monsters of Evil. (Venom II#24) - When Hellstrom unleashed the Monsters on Venom at the Bronx Zoo, Gragoa was first to strike, whipping Venom with its studded tails. (Venom II#25) - Gragoa grabbed Venom in its mouth, but released him when Venom jabbed its muzzle with spiked tendrils. When Venom pulled a gun on Hellstrom, Gragoa snagged him with its tail and flung him across the zoo. 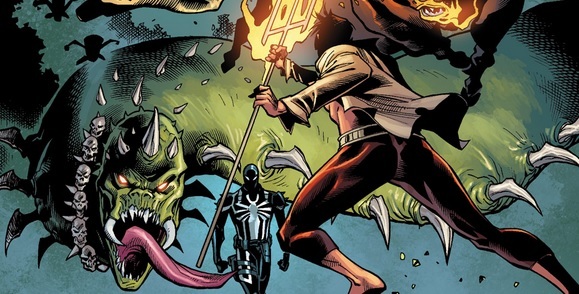 It joined the rest of the Monsters in hunting him down; drawn by the Sphinx's screams, it came to Venom, who convinced them that Hellstrom was their real enemy. Gragoa joined the Monsters in attacking Hellstrom, and then fled when Venom released them. (Venom II#42) - Mephisto summoned Gragoa and the other Monsters of Evil to an abandoned Atlantic City casino through DOA member Master Mayhem's body in order to prevent the DOA from ruling Hell. The Monsters' new master, teenage symbiote Mania, sicced Gragoa and the others on the DOA. Gragoa took out a number of DOA troops before Mephisto sent him and the other Monsters back home - along with their fallen foes as a snack for the trip. Gragoa is a massive bull-like creature with a long, trifurcated spike-studded whip-like tail. (Venom II#25 (fb) ) - Lord Tiki was an ancient Polynesian idol, brought to life by a botched fertility ritual. At some point Daimon Hellstrom and the DOA captured it and possessed it with a demon, inducting it into their Monsters of Evil. (Venom II#24) - When Hellstrom unleashed the Monsters on Venom at the Bronx Zoo, Lord Tiki attacked him after Gragoa had knocked him down, overwhelming him with his miniature minions. (Venom II#25) - Lord Tiki attacked Venom on Hellstrom's orders, and joined the rest of the Monsters in hunting Venom down when Gragoa accidentally flung him to safety. Drawn by the Sphinx's screams, it came to Venom, who convinced them that Hellstrom was their real enemy. 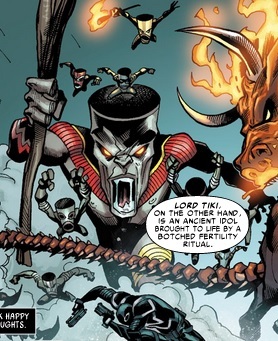 Lord Tiki joined the Monsters in attacking Hellstrom, and then fled when Venom released them. (Venom II#42) - Mephisto summoned Lord Tiki and the other Monsters of Evil to an abandoned Atlantic City casino through DOA member Master Mayhem's body in order to prevent the DOA from ruling Hell. The Monsters' new master, teenage symbiote Mania, sicced Lord Tiki and the others on the DOA. Lord Tiki took out a number of DOA troops before Mephisto sent him and the other Monsters back home - along with their fallen foes as a snack for the trip. Lord Tiki can release dozens of miniature variations of itself from within his head, many armed with axes and torches. He himself carries a large torch/staff. (Venom II#25 (fb) ) - Skunk Ape was a human scientist whose evolutionary research backfired, transforming him into a giant simian. At some point Daimon Hellstrom and the DOA captured him and possessed him with a demon, inducting him into their Monsters of Evil. (Venom II#24) - When Hellstrom unleashed the Monsters on Venom at the Bronx Zoo, Skunk Ape was among them. (Venom II#25) - Skunk Ape attacked Venom on Hellstrom's orders, slamming him with his massive fists and hitting him with a noxious spitball; he then joined the rest of the Monsters in hunting Venom down when Gragoa accidentally flung him to safety. Drawn by the Sphinx's screams, he and the other Monsters came to Venom, who convinced them that Hellstrom was their real enemy. 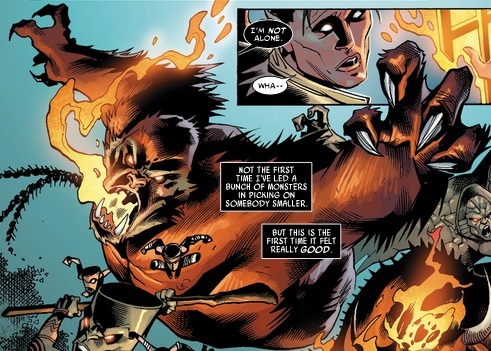 Skunk Ape joined the Monsters in attacking Hellstrom, and then fled when Venom released them. (Venom II#42) - Mephisto summoned Skunk Ape and the other Monsters of Evil to an abandoned Atlantic City casino through DOA member Master Mayhem's body in order to prevent the DOA from ruling Hell. Sensing that teenage symbiote Mania was their new master, Skunk Ape freed her from the demonic Gargoyle Brothers; she then sicced Skunk Ape and the others on the DOA. Skunk Ape took out a number of DOA troops before Mephisto sent him and the other Monsters back home - along with their fallen foes as a snack for the trip. Skunk Ape is a massive simian with sharp claws and teeth, and the ability to spit noxious chemicals from his mouth. He was apparently a skilled biologist at one time, but it is unclear whether he retains any of his human intelligence. (Venom II#25 (fb) ) - The Sphinx was accidentally brought forward in time to the present from its native ancient Egypt thanks to its own riddles and curses. At some point Daimon Hellstrom and the DOA captured it and possessed it with a demon, inducting it into their Monsters of Evil. (Venom II#24) - When Hellstrom unleashed the Monsters on Venom at the Bronx Zoo, the Sphinx was among them. (Venom II#25) - The Sphinx attacked Venom on Hellstrom's orders, pinning him to the ground with its claws until Venom knocked it aside with a tendril; it then joined the rest of the Monsters in hunting Venom down when Gragoa accidentally flung him to safety. Venom ambushed the Sphinx, leaping into the mouth of its central head and stabbing it from the inside with spiked tendrils. 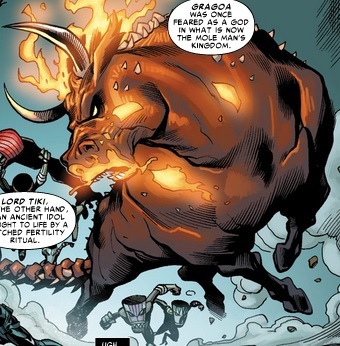 Its screams summoned the other Monsters, allowing Venom to convince them that Hellstrom was their real enemy. 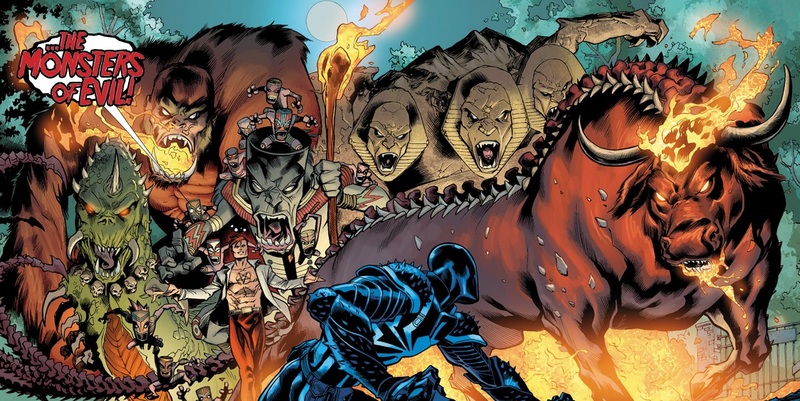 The Sphinx joined the Monsters in attacking Hellstrom, and then fled when Venom released them. (Venom II#42) - Mephisto summoned Sphinx and the other Monsters of Evil to an abandoned Atlantic City casino through DOA member Master Mayhem's body in order to prevent the DOA from ruling Hell. The Monsters' new master, teenage symbiote Mania, sicced Sphinx and the others on the DOA. Sphinx took out a number of DOA troops before Mephisto sent it and the other Monsters back home - along with their fallen foes as a snack for the trip. The Sphinx is a massive animate stone statue with three fanged heads. It is apparently capable of administering curses. (Venom II#25 (fb) ) - The Worm is an alien that came to Earth to study humanity - which she did by committing a string of cattle mutilations. Once the local farmers discovered she was the culprit, they destroyed her spaceship and the lab inside it. At some point Daimon Hellstrom and the DOA captured her and possessed her with a demon, inducting her into their Monsters of Evil. (Venom II#24) - When Hellstrom unleashed the Monsters on Venom at the Bronx Zoo, the Worm was among them. (Venom II#25) - The Worm attacked Venom on Hellstrom's orders, all the while beseeching Venom to join them; she then joined the rest of the Monsters in hunting Venom down when Gragoa accidentally flung him to safety. Drawn by the Sphinx's screams, she and the other Monsters came to Venom, who convinced them that Hellstrom was their real enemy. The Worm joined the Monsters in attacking Hellstrom, and then fled when Venom released them. (Venom II#42) - Mephisto summoned the Worm and the other Monsters of Evil to an abandoned Atlantic City casino through DOA member Master Mayhem's body in order to prevent the DOA from ruling Hell. The Monsters' new master, teenage symbiote Mania, sicced the Worm and the others on the DOA. Gragoa two DOA troopers in armored exoskeletons before Mephisto sent her and the other Monsters back home - along with their fallen foes as a snack for the trip. The Worm is a massive wormlike alien with sharp horns, mouthparts, and pseudopods, and a prehensile tongue. She is apparently highly intelligent., and is capable of telepathic communication.